“UFC 217: Bisping vs. St-Pierre” goes down Saturday night inside New York’s historic Madison Square Garden. UFC Fight Pass streams the first two preliminary bouts live starting at 7PM ET/4PM PT. Fox Sports 1 airs the remaining four prelims at 8PM ET/5PM PT. The UFC’s return to Broadway features a trio of title tilts. 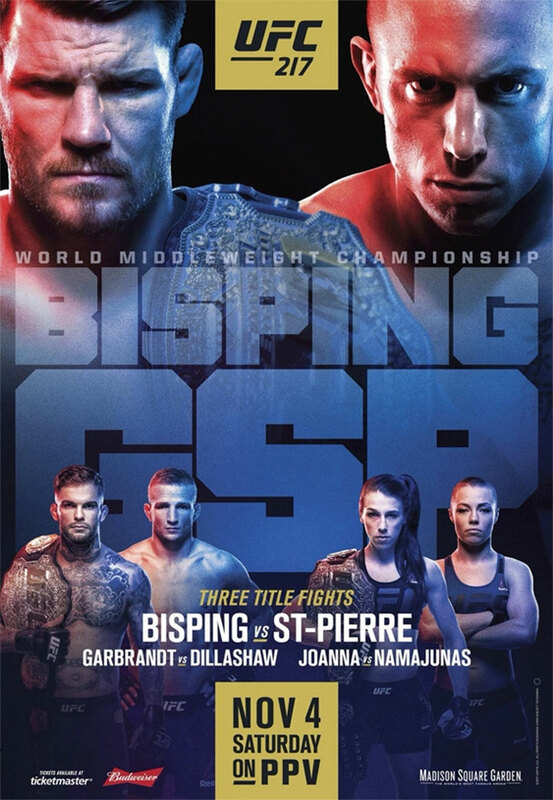 Middleweight champion Michael Bisping welcomes former UFC welterweight king Georges St-Pierre back from his four-year “break from MMA” in the show’s featured attraction. St-Pierre will join BJ Penn, Randy Couture and Conor McGregor as the only fighters in UFC history to hoist belts in multiple weight classes if he emerges victorious. Bantamweight champ Cody Garbrandt puts his gold on the line against former Team Alpha Male teammate turned archenemy TJ Dillashaw in the co-main event. Joanna Jedrzejczyk will also defend her strawweight throne against Rose Namajunas. Jedrzejczyk looks to tie former women’s bantamweight champion Ronda Rousey for most consecutive UFC title defenses for a female with six.